I recently listened to this message by John Piper about the task of world missions. Yes, it’s more than an hour long, but I still recommend it as being worth your time. The transcript is also available, so you could read it instead if you prefer. I listened to it while I was working in the kitchen. When there are so many needs and causes pressing in on us, and people asking for our time and resources, we need clarity and vision to know where our limited resources should be going. Listening to this message helped do that for me. Whatever you do, on no account condemn anyone; do not even try to judge whether a person is good or bad, but keep your eyes on that one evil person for whom you must give an account before God: yourself. I’ve been spending my time criticising and judging someone in my church, trying to figure out where they are spiritually, praying for them, deeply frustrated by them…. This quote helps put things in perspective. This post was first published last year as a guest post on one of my favourite blogs – The Recovering Legalist. I encourage you to go visit! I come from a country that is famous for its sheep. New Zealand used to have more than 70 million sheep. Now the number is about 29 million, according to teara.govt.nz. August is the best time of year to see the sheep, as it is late winter, when the ewes are lambing. It is delightful to watch the lambs gambolling in the fields playfully, so different from their sedate mothers. Thinking about sheep gets me pondering all the Biblical references to sheep. The way we farm sheep here in NZ is quite different from 1st Century Palestine or how David cared for his father’s sheep before he became king of Ancient Israel. These differences can teach us something about our relationship with God. It’s clear from reading the Bible texts that the good shepherds in those days (like David) had a small number of valued sheep, each one of which was known by the shepherd, and who knew the shepherd and followed him. Contrast this with modern farming, where a farmer will often have hundreds, if not thousands of sheep. They live in fields fenced by barbed wire. They are seen as stupid animals, that the shepherd herds by using dogs to make them obey his will. You do not see a shepherd leading his sheep, instead driving them in front of him. They have an ear tag with a number to identify them to the sheep farmer. To me this speaks of two different ways of relating to God. What kind of sheep are you? One kind is motivated by fear, and kept safe by barbed wire. These fences are like the extra rules that we make for ourselves or that others make for us, to keep us safe and away from sin. But they also keep us from following the Shepherd to green pastures. Instead we are boxed in where the grass has been overgrazed, living on stale hay. Some sheep break out, thinking that the grass looks greener elsewhere, and end up on a busy road or in a ditch. This is like those who break away from legalism to do their own thing, or those who fear the Shepherd and his voice, and shipwreck their lives as a result. Both are far from the Shepherd. The Good Shepherd’s sheep are motivated by love for their Shepherd. They trust him to keep them safe and fed, and they follow him wherever he leads. He leads them to green pastures and restores their souls. He protects them in the darkest valleys and lays down his life for them. Jesus said, “If you love me, keep my commands. And I will ask the Father, and he will give you another advocate to help you and be with you forever — the Spirit of truth.” The Good Shepherd’s sheep are led by the Holy Spirit. Jesus is not a factory farmer. He wants us to know his voice and follow him out of love. He doesn’t want us to be penned in by traditions or extra rules, but instead to walk with him to green pastures and fresh water. And here’s a fun kids’ song to finish – one of my 4-year-old son’s favourites! When going through another bout of depression, I must hold on Jesus. The feelings come and go, but He is always the same. There are times when a hymn can do what nothing else can do.The Solid Rock, written by Edward Mote (1797-1874), has been my favorite hymn for as long as I can remember, but for today it is on the second and third verse I want to focus. I would like to share this post from a blog that is very special to me. Three and a half years ago God used this blog to help me to find freedom and peace, to know that I am under grace, not under law, and that Jesus is enough. I really believe the human default (for adults that is) is law and legalism. I am not sure we are born with it, but society operates on this paradigm so it’s drilled into us at a very early age. Even if you don’t grow up in a legalistic religion, classmates and teachers both will make sure you understand the ground rules of success both socially and academically. How far back can we trace our fear of failure and rejection? Maybe parents were critical and you felt you must achieve something to gain their love. I am starting to see behavior-based religion as a secondary element that we choose because it flows with the worldview we already have. All the world religions I know of fall well into this same paradigm. Imagine a nine-year-old boy playing the violin. He has an excellent ear and almost never plays a wrong note. He can play any tune he hears. But the sound coming out of his violin doesn’t match the music in his head. It is scratchy and weak. Despite regular practice, he does not seem to improve. It is frustrating to listen to him, knowing the possibility of his talent. That was our son a year ago. 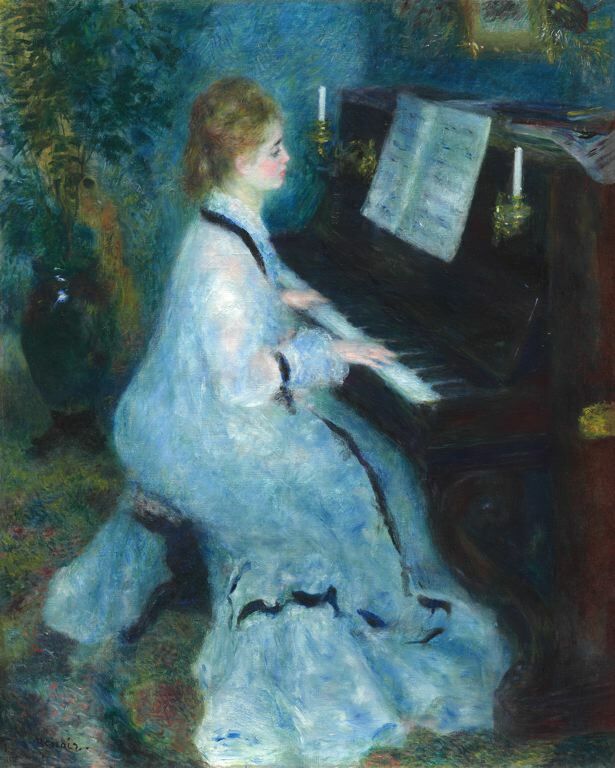 We had taken him to violin lessons, but his teacher had not worked enough on good playing habits, instead forging ahead with more and more difficult music, because of his excellent ‘ear’ and ability to read music. At first we were pleased with his progress, but as the music got harder his bad playing habits began to hamper him, until his playing was no longer a pleasure for the listeners. He had poor posture, and his hand was crooked as he held the violin. His bowing was weak. Something had to be done. An email came into my inbox from the homeschooling network to which we belong, someone recommending their daughter’s Suzuki violin teacher. The cost would be higher than what we were already paying, and it was further away. But I had been praying for guidance. We decided to leave the old teacher and try the new. She took him right back to the beginning, back to ‘Twinkle Twinkle Little Star’. I tried not to care, thinking, “It won’t be long before she’ll move him on to the pieces he was playing before.” She worked on his bowhold first, then his hand position. Week after week, she has been working on his playing habits – making sure the bow goes in the right place to get the best sound, standing up straight, hand in the right position, thumb pointing up at the ceiling not lying down. Every day when he practises at home I watch him to make sure that he is following her instructions. Almost a year later, he is still not playing the more difficult pieces he was before, but the sound that comes out of his instrument is a hundred times better. His playing habits are not perfect, but vastly improved. I have learned patience, waiting for the fruit of our labours, knowing that this time nurturing his musical gift will be worth it in the end. The concertos will come, but the foundation must be properly laid. 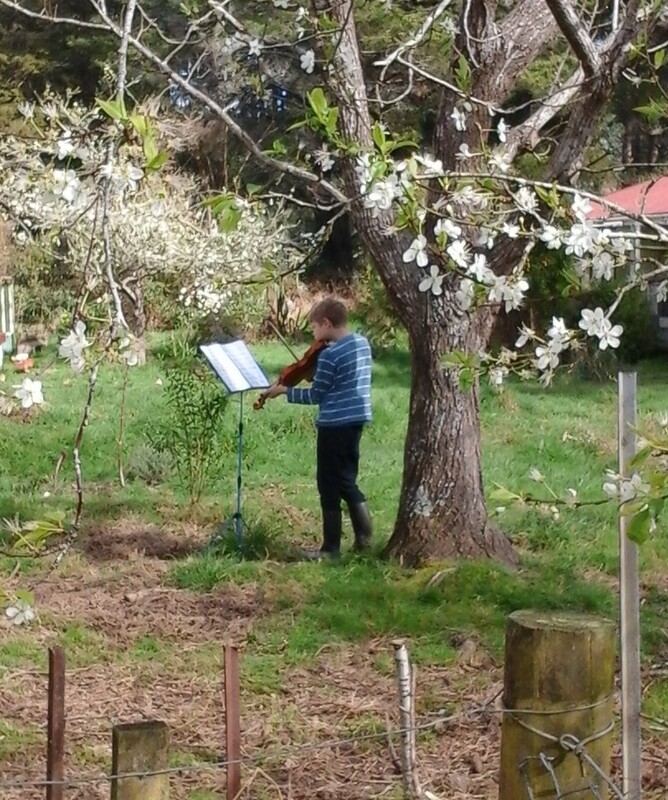 As I was watching him at his violin lesson recently, I started thinking about what God has been doing in my life, about the bad habits that held me back from His purposes for me: self-pity, pride, criticism of others, self-condemnation, anger, impatience. Like me watching my son practising his violin, the Holy Spirit reminds me when my thoughts and behaviour go off the rails. He is patient and never condemns, but I am frustrated at times because I want to be so much further on than I am. However as we continue together, the new behaviours will become the norm, and the old will fall to the side. Already, some bad habits have died, and others are breathing their last gasp. It seems like I am like an onion, with layers that need to be peeled off. God does some things in a hurry, and others take more time. I have been going through an intense spiritual and emotional shake-up since Easter, when I had a disagreement with a family member. The rift dragged up memories from my childhood, of the feeling of never being good enough, and it was like I could hear my family member condemning me and my life in my head. Every criticism or perceived criticism by this person and other people came to mind, and it was almost unbearable. For the last few weeks God has been working away at the festering wound of my resentment and childhood pain, getting rid of it for good. He’s been working on my thinking about my parents, showing me that I need to focus on and remember the good things about them. He has shown me that I needed to repent and change my attitude towards them (Whatever is Lovely…). He’s been reminding me that my identity is in Him, not in my human family (Pain). He has promised me that He’s filling in ‘the pit’ of depression, so that I will be able to jump for joy (God’s Landscaping Business). And last week, He showed me how to forgive. Recently I have been reading the book To Forgive is Human, in this quest to forgive and find lasting peace. It discusses stages of forgiveness and why people forgive, for example, because of social pressures, or because they want peace in their family. Reading about human reasons for forgiveness got me thinking about God, and why He forgives. Obviously there is no outside pressure on Him to forgive – He is the one that makes the rules. I realised that forgiveness is part of who He is – it is His nature. He does not experience the struggle that we often do to let go of past hurts and forgive. In fact, His commitment to forgiveness is so great that He paid the ultimate price so that our relationship with Him could be restored. As Jesus was taunted by his enemies on the cross he said: “Father, forgive them, for they know not what they do.” (Luke 23:24) He had no desire for revenge, only empathy that pitied His enemies and recognised their blindness. Why not let my resentment go, and let Heaven into the dark places of my heart, the not-so-secret corners, where I squirrel away my grudges and bitterness? As He is, so shall we be. My Father’s nature is to forgive, and I am His child, therefore unforgiveness has no place in me. For some time now (for years, to be honest) I had been holding on to resentment for hurts in my past, knowing that I should forgive but unable to find peace. That word ‘should’ is like a weight around one’s neck somehow – all the things that we ‘should’ do but just can not. It had helped to concentrate on the good things about those who had hurt me, but somehow I was still struggling with forgiveness. However as I thought about who God is, and who I am as His child, I was able to let it go. I saw how much I had been forgiven myself, and the sins of others against me were a mere pittance in comparison. He takes away the burden of resentment and replaces it with joy – the joy of a prisoner set free. The following article is reproduced with permission from the Asia Harvest website. Please visit their site for more information and to donate to the China Bible fund. Christians around the world continue to be fascinated by the Church in China—the world’s most populated country. The nation is going through rapid transformation economically, socially, culturally and spiritually. We examine how these changes are affecting the kingdom of God in China, and specifically how it may affect some of the projects we implement there. Often as people grow older they long for things to stay still, so they can get their bearings, put down roots, and enjoy a consistency in their lives. Things never seem to work out that way, however. The world is in a constant state of transformation, and our time can easily be spent trying to catch up with the changes going on around us. Of all the places in the world we know, nowhere is changing as swiftly and as dramatically as China. In part, this is because of the draconian decades of hard-line Communist rule, when the nation closed its doors to the rest of the world from the 1940s to the late 1970s. Feeling left behind by these lost decades, China has frantically been catching up since at breakneck speed. We have been greatly privileged to serve the Lord Jesus and His Church in China since the late 1980s. The pace of change has been so swift during that time that often when we meet younger missionaries starting out, it’s difficult to describe what China was like back then without sounding like ‘old fogies’ reminiscing about things “back in the day”! Just a little more than 20 years ago the streets of cities like Beijing and Kunming were filled with bicycles and donkey carts. Today they have become mega- municipalities with glistening skyscrapers, congested highways and all the latest shopping malls and facilities like any other major world city. More changes seem to occur in five years in China than in a generation in other parts of the world. Consider this for example: The first place many visitors to China see is the town of Shenzhen, just across the border from Hong Kong. It was a farming village in the 1970s, then a sleepy town with about 50,000 people in the 1980s. Remarkably, today Shenzhen is a massive, modern city, home to more than 8 million people! The rapid transformation in Chinese society is inevitably also influencing the way the Church functions. For decades the Body of Christ experienced the largest revival, numerically speaking, in the history of Christianity. One of the foundations for the revival was suffering and sacrifice. The Church gave their all to Jesus, and He used them for His glory in a marvellous way so that today there are at least 100 million Christians in China. Late last year the government made two announcements. The first was that they were relaxing the one-child policy that has been in place since 1979, and which has wreaked havoc on the family structure of the nation. The second announcement they made did not receive widespread coverage in the media, but it has major ramifications for the Church: The Chinese government announced it was immediately closing down all prison labor camps. For decades, prison labor camps were dark, abominable places where hundreds of thousands of Christians were sent as punishment for their belief in Jesus. Many were never heard from again. Countless faith-filled testimonies, like that of Brother Yun in his biography The Heavenly Man, included accounts of the brutal punishment metered out in those awful places, where prisoners were forced to work 14 to 16 hours a day, seven days a week. Every head turned around and stared at me, and people began to chuckle under their breath. They knew their foreign guest had probably never been imprisoned for the Lord before. All the other men and women in the room had spent time in prison labor camps, some for decades. Sensing that I was feeling a little anxious, the Chinese broke into hearty laughter and then lovingly served me first. Labor camps caused untold suffering to multitudes of believers and their family members in China. Now, all of a sudden with the stroke of a pen, they have been consigned to history! Of course this change doesn’t mean that persecution has ceased in China. In fact, just recently reports have emerged of church buildings being demolished and of believers being arrested and fined. As long as the kingdom of God continues to clash with the kingdom of darkness there will be hardship and suffering for those who follow in the footsteps of Jesus. Christians in China continue to be fined, harassed, and discriminated against because of the Gospel. While prison labor camps have been closed, please note that these were not the same as general prisons, where people can still be sent without trial for up to three years. The labor camps, however, were the staging point for the most severe persecution. The Chinese Church has now entered into a new phase. It is wonderful news that the labor camps have been abolished, and severe persecution has undoubtedly decreased from the levels of the past. We should be thankful for the positive changes. They are the direct result of the Lord’s intervention and His gracious response to decades of prayer. Most of us would agree that if our lives were under constant threat of being fined, beaten and imprisoned, then news that labor camps have become a thing of the past would be greatly welcomed! As the winds of change continue to blow throughout China, a fresh and difficult challenge has emerged. Church history shows that Christians are strongest when they are united against opposition, but when times are easy our faith tends to grow weaker. Is this principle true in your own life, and in the churches in your part of the world? It was also true in the Old Testament, as Israel struggled to break free from the cycle of pride and laziness caused by prosperity. God summed up the plight of His chosen people this way: “I cared for them in the wilderness, in the land of burning heat. When I fed them, they were satisfied; when they were satisfied, they became proud; then they forgot me” (Hosea 13:5-6). Friends, please continue to pray fervently for God’s will to be done among His children in China. Even though believers now face some different challenges than previous generations, the Body of Christ in China remains huge and influential. Although the Chinese Church may function differently going forward, the fact remains that there are tens of millions of people who have been purchased by the Blood of Jesus throughout China. They love Him, and they will continue to testify about what God has done in their lives. These disciples of Christ are well aware that there are more than one billion lost souls in China, among hundreds of unreached ethnic groups, and that their work is far from finished! Although systematic, government- orchestrated persecution of Christians is definitely decreasing in China, it would be a mistake to assume that there is no longer any persecution. It persists, especially in rural areas away from the public gaze. We constantly review and tweak the projects we help with, as we desire to be involved in the most strategic opportunities for the advancement of God’s kingdom in Asia. While things are changing quickly in China, one project that will remain a great need for some time to come is the China Bible Fund. There are other factors at play which cause the dire shortage of Bibles in China, especially among the rural house churches we are privileged to serve. While the economy is growing in many parts of China, all Bibles printed outside the control of the government- approved church are considered ‘illegal’. Those involved with their production or distribution continue to risk arrest and prison without trial. Secondly, almost all of the Bibles we print inside China are for rural believers in farflung provinces. Despite the economic boom in other parts of China, people in rural farming communities remain extremely poor by any standard, and in fact their plight has been exacerbated by the soaring cost of living. Millions of house church Christians remain unable to afford Bibles, even if they were able to access them. These factors have resulted in millions of believers being starved of God’s Word. They are forced to survive on the few crumbs they are able to gather from beneath the table of the registered churches. As a child I listened to my grandfather playing on his baby grand piano, and I thought, “I wish I could do that.” I would look at the musical score and tried to figure out what it meant, but all I could understand were the letters ‘m’, ‘p’ and ‘f’. Were they notes on the piano somewhere? I tried to play them but it didn’t sound anything like my grandfather’s playing. Then when I was seven my parents sent me to piano lessons. The written music started to make sense. This was something I loved to do, and I never had to be told to practise. Unfortunately after about six months of lessons we moved and the lessons stopped. Playing the piano became a dream once more. I had to wait until I was nearly 12 before starting lessons with another teacher. During the waiting time I borrowed other people’s piano books and figured out quite a lot on my own. A piano teacher, who I hoped would teach me, frowned disapprovingly when I told her this, saying, “You’ll be picking up bad habits.” Perhaps I was, but music was already an important part of me. Once I started lessons again I worked hard, but was never a prodigy, just an above average amateur. I played in church for the first time when I was 14. At first I would have to practise for weeks before I could accompany the congregation. I spent hours playing all the songs in the book so that I would be ready whenever I was needed. I learned how to play using chords and later on, how to play by ear. There were always others who were better than I was – one of my classmates who had started learning earlier, a younger girl who had learned using the Suzuki method, someone else who played the same pieces that I did, but so much faster. There was an ugly envy in me. I tried to get into the performance programme at university, but my application was declined. I hardly talked about it afterwards, because I was so embarrassed that I had even tried. I stopped playing anything challenging for a long time after that. My husband and I met over a piano keyboard. He was playing in church. I didn’t know anyone, so I thought I’d talk to him. I didn’t think much of him at that first meeting, but fortunately he was more impressed than I was. 🙂 Our first ‘date’ was playing duets. We play at approximately the same level, albeit with different strengths. It is in keeping with God’s beautiful design in bringing us together – ‘oak and ash in a dove-tail joint’. When I was in my early thirties I decided to have piano lessons again, as I had never done any exams, and wanted to be able to teach piano. Over the next few years I played lots of Beethoven and Bach, and was introduced to Scarlatti and Brahms, and learnt about cadences and what a second inversion meant (“Drama!” my teacher said). It took a few years, because I had our fourth child during that time, as well as homeschooling, but finally I was able to sit the ATCL performance exam, and passed, at the ripe old age of 35. But I’m still only an above average amateur, and I still struggle with pride and envy. I realised that last week when someone at church commented that she missed hearing my husband playing, as she had heard me playing more often. She commented about his style being different from mine, and how he was ‘very accurate’. The ugly green-eyed monster hadn’t died yet. I was hurt and put out. Something important to me was under attack. Thankfully we sorted it out the same day, and she realised she had been making some wrong assumptions (she thought that I had been stopping him from playing, when I hadn’t).